I've substituted this little vintage shelving "cupboard" that I'm using for kitchen decor and cookbooks to be my new "designated flat decor surface". 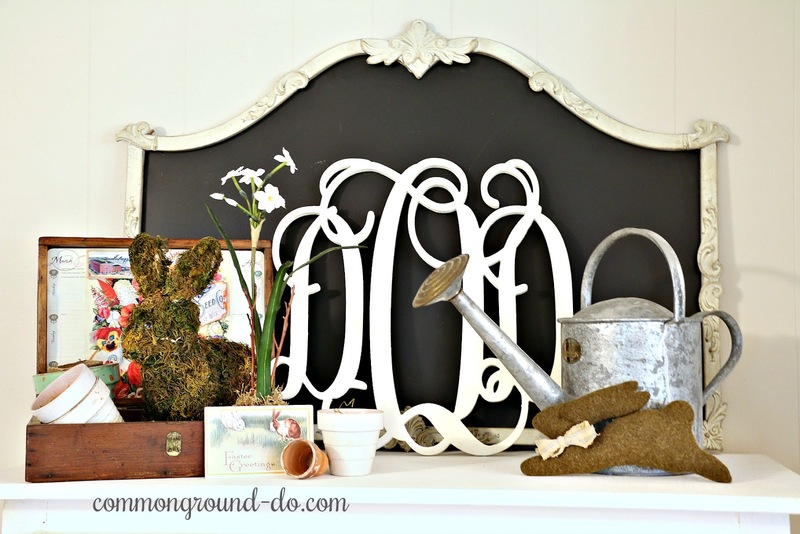 The chalkboard from Pier 1 several years ago is a perfect backdrop for my white wooden monogram and for whatever works for seasonal fun. I did have a white birdcage here, but moved it out to the Garden Room. 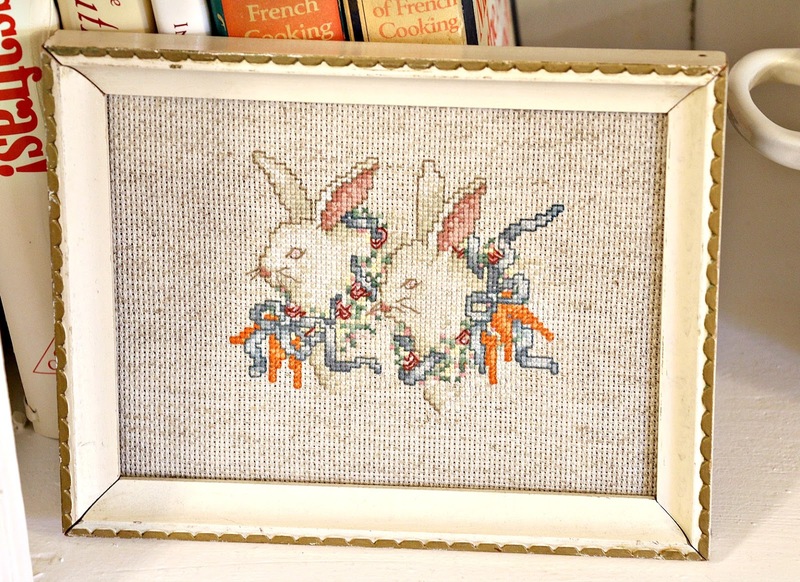 I wanted to share this little cross-stitch piece of two Springtime Rabbits. The little blue floral garland around their necks has a few carrots added on. I found this little piece while I was going through boxes from storage this last winter during the move. I had some loose vintage frames with glass that were empty, so it fit perfectly for a sweet little Springtime accent. 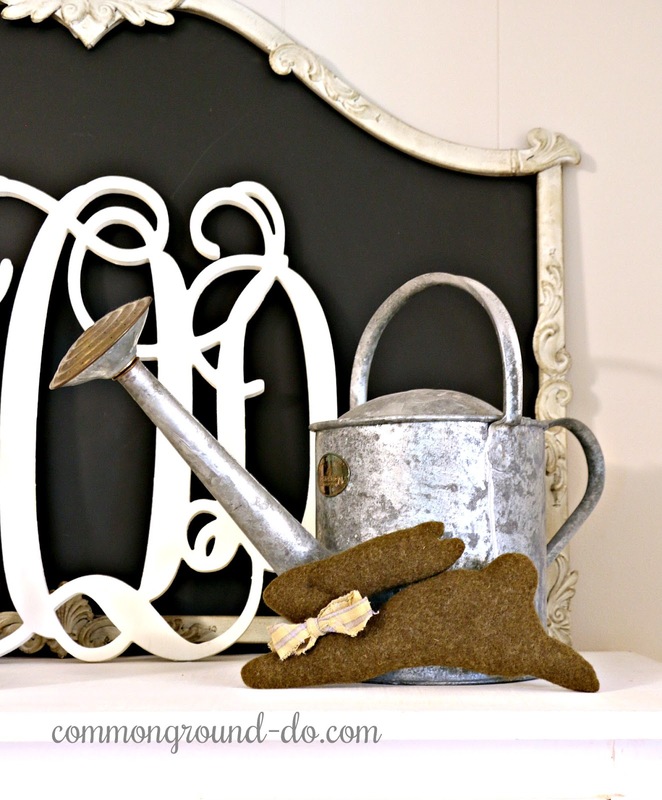 My galvanized Restoration Hardware watering can and a felted wool rabbit are here this year, since I haven't had a chance to use my Seed Packet Wreath. A moss bunny is sitting in one of my "make your own" seed boxes, along with some old vintage painted flower pots and a faux paperwhite bunch. I think this vintage cabinet will be just as much fun as the china cuboard for display. It's a little easier for me to decorate, since I don't have to stand on a stepladder to get to it! We finally got the old house on the market. Can I just say YAY??!! Hope you're having a wonderful Easter Week. Good Morning Debra. 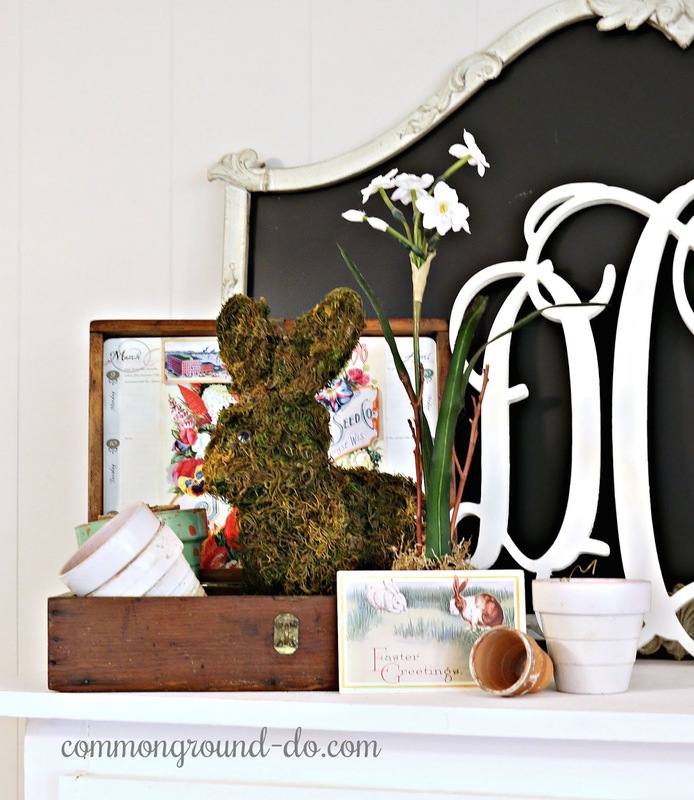 The vignette is so cute and pretty for Easter. Wishing you a really wonderful rest of the week and a great Easter Sunday. thankyou Kris. you guys have a wonderful Easter! 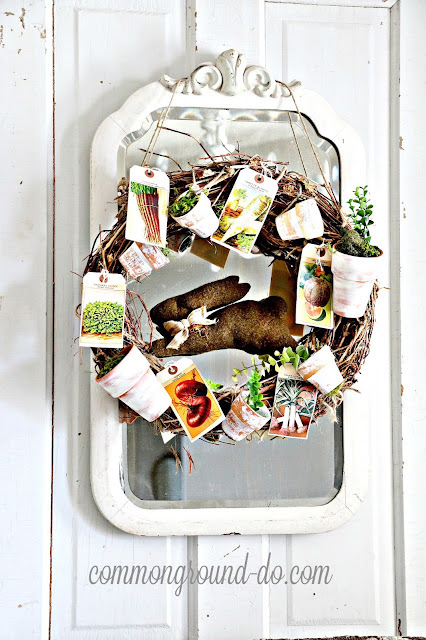 Love your little bunny in the seed box...and hope you have a Happy Spring in your new home! So many cute spring treasures! I love the cross stitch. Congrats on having the house listed! I know that is a big weight off your shoulders. Have a blessed Easter weekend my dear friend! Isn't that cross-stitch so sweet? I cannot remember where or when I came to have it. I'm getting old, yikes! Have a wonderful Easter Amber! 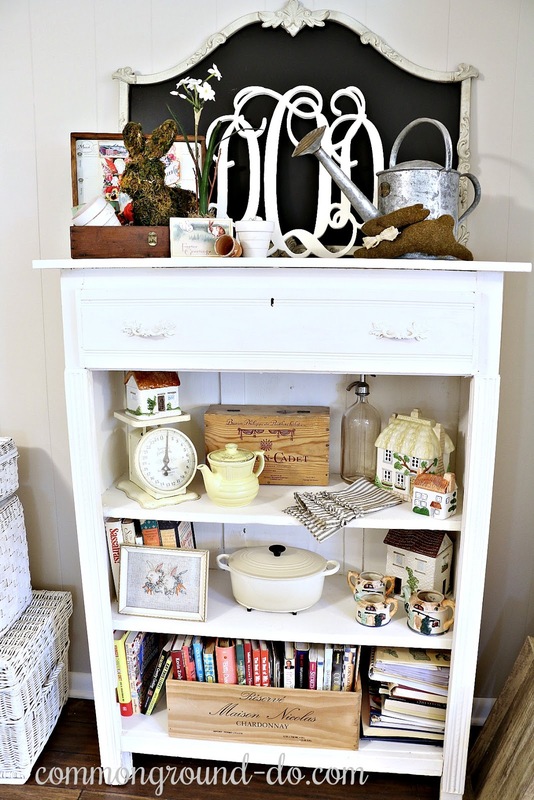 Love this cabinet for your flat display area! The moss bunnies are adorable! Congratulations on getting your house on the Market! Here's wishing you a quick & firm $ale! thankyou Pat, that moss bunny is looking a little sad, but he was so cute! Yay!!! for house on the market!! I just have one question.....when will this big-a$$ house ever be empty?? I am so sick of it all.....I am temporarily cured of wanting to do any shopping or gathering. I'm so happy for you. Your cabinet top is darling. I hope it was a blessed Easter.